I know that it’s currently hotter than it actually was most of the summer, but I can’t wait any longer to start sharing some fall-ish recipes. It’s like the minute September hits, my taste buds automatically need apple and pumpkin and spice. Even if summer produce is still in season, mentally I prefer anything and everything fall. I love this crisp. Not only because it has the words salted caramel in it, but because its so easy and super delicious. Now I just adore making pies as I’ve made pretty clear around here. (I even confessed my dream of opening my own pie shop someday,) but the fact that this baby is crust-less, therefore making it that much easier to throw together is a huge perk. The apples are tossed with some sugar and spices and they are cooked with a few other ingredients to make the mixture warm and caramelized. The mixture gets tossed into a dish and topped with a super crispy crumble topping. After baking, I drizzled some caramel sauce on top, mostly because I always have it around and I thought it would be pretty. Of course it was an amazing touch, but feel free to skip the caramel drizzle if you are pressed on time. Vanilla Ice Cream though, is hardly optional and I consider it a must to serve this with. Are we Ok with fall recipes happening folks? Because I for one can’t get enough! Preheat oven to 375F. In a large pot over medium-high heat, (I used a 5qt dutch oven but anything large works,) combine all the filling ingredients. Toss well to evenly mix the ingredients and stir a bit while the butter melts. Turn filling into an 8x8 inch pan or 9 inch pie dish and set aside while you prep the topping. Such a fun, easy recipe. Caramels and apples are so tasty together! A big yes to fall baking (my fave time of the year), apples, pumpkins and everything spice! 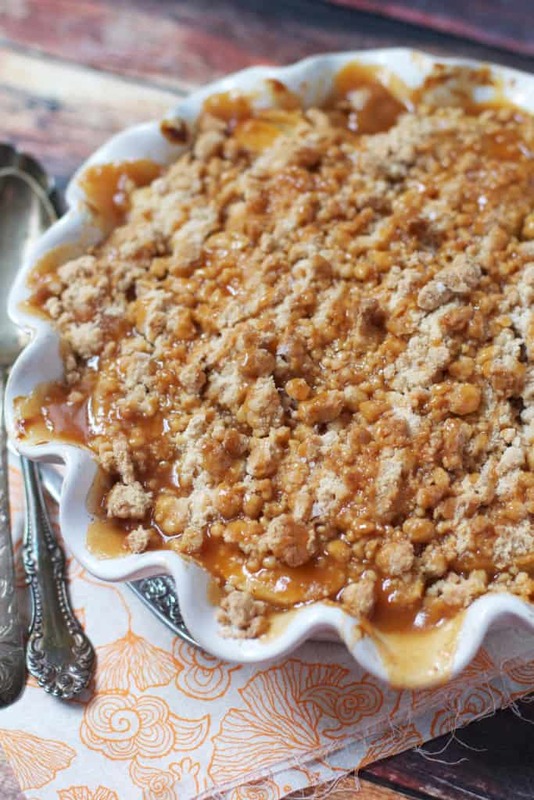 love this crisp and totally checking out your caramel sauce! Somehow when fall recipes start popping into my brain I jump straight to pumpkin. Which may be why I resist baking pumpkin recipes for so long because it’s still hitting the 80s here! It;d be much easier to transition my seasonal baking if I did the obvious thing and did apple first. Especially this crisp. Caramel = swoon! 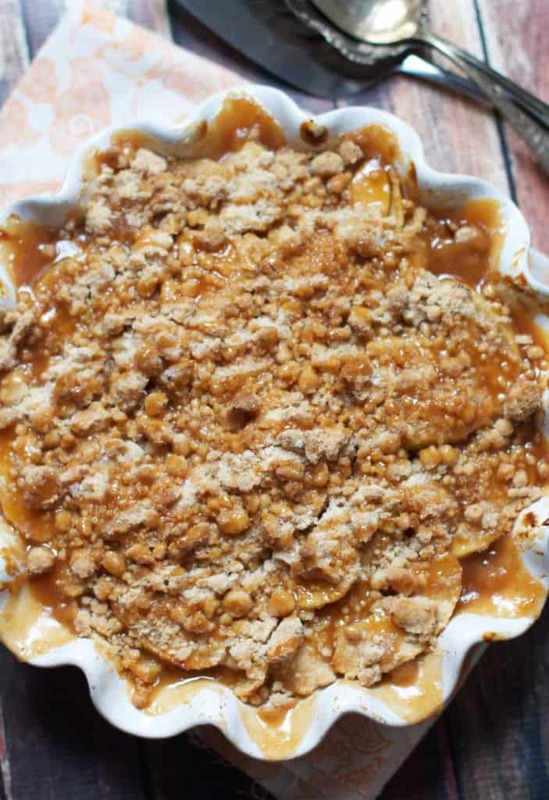 apple crisp is one of my all time favorite desserts – add salted caramel and I just might be in heaven!! Yum! And although it was 90 degrees here yesterday and won’t cool down until November probably – the light has changed and school has started – it’s FALL. I am SO OK with fall recipes already if they are anything like this crisp. I can’t wait to bake this! I was SO CLOSE to baking with apples this weekend. I just can’t wait for fall baking! You’ve got me pumped now! Talk about taking an apple crsip to the next level! Salted caramel? I’m there! I love love love crisps. Don’t get me wrong, I love a good homemade pie, but to be honest pies are too much of a fuss to me, so crisp is the way to go! This one looks so flavorful and decadent with that drizzle of caramel on top, the perfect Fall dessert! Okay FINE, we can get this whole fall thing started. :P But only if you promise there is salted caramel involved. This looks AMAZING! I’m super ok with fall a ‘comin. And alllll of dat caramel. 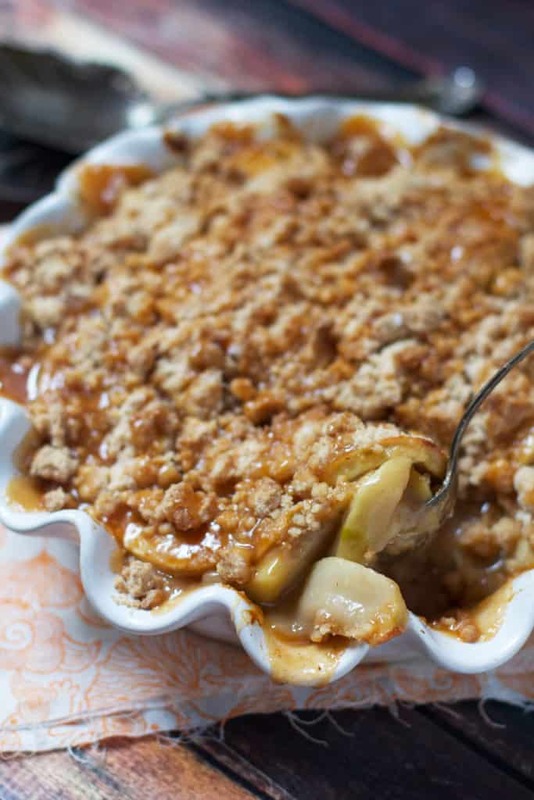 I love apple crisp. Most recipes call for oatmeal and I am not a fan of oatmeal in my crisp! Thanks for the recipes, it sounds delicious. I just popped this bad boy into the oven and I can’t begin to tell you how hard it was to get it that far. I wanted to eat ALL the filling before it hit the pie tin! I’m 8 months pregnant so finding the energy to make much of anything is a task but when I saw this yesterday (on Pinterest) I just knew this was on my to do list!! So glad I did. They are going to chow down on this at Church Supper tonight! this sounds delicious! Would like to make it for Thanksgiving instead of a pie. Have you ever made it or prepped it the night before? Thanks! You can totally make the filling and make the topping and then bake it day of. I haven’t tried making the whole thing in advance but I imagine that would be fine too! Hi! I made this about a month ago for a family reunion and it was a huge hit! So amazing! This looks amazing! I’m planning on bringing it to my sister’s house this Thankspgiving. I was planning on baking it in the morning. When should I add the caramel sauce? Thanks. Happy Thanksgiving! Just made this for dessert tonight. I forgot the caramel sauce, but it was still fantastic. I added pecans to the topping, and they were delicious. Thanks for the recipe! It’s a keeper!